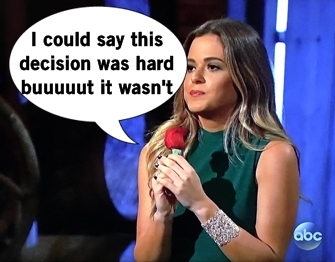 Previously on The Bachelorette, Chad was eliminated in the 2-on-1 Thunderdome date. Then men rejoiced and their celebration continues with scattering the remainder of Chad's protein into the wind. 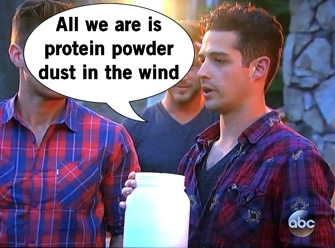 Why the show didn't pay for "Dust in the Wind" music rights, I'll never know. 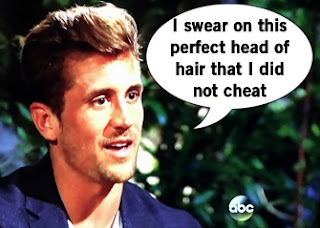 For some reason, Chad gets to return to the house to pickup his luggage unlike any other person eliminated on a date. He returns and leaves unapologetically and I'm so relieved this is ending because this storyline is draaaagging. After this one last heavy-handed move from production, Chad is gone for good. See you in Paradise, Chad. It's time for the cocktail party and rose ceremony, where the vibe is better without Chad around. Chase somehow gets ahold of giant inflatable hamster balls to bump into JoJo and weirdly kiss inside of it. Robby and JoJo toss coins into a fountain (which she asks him how to do it, like legit is this how you toss a coin in a fountain for luc) and kiss in full view of all the other men. James F writes JoJo a poem which is quickly interrupted by Alex, high off that I-survived-Thunderdome-date swagger. Even with a rose, Luke gets alone time to reiterate how awesome the date was and he's falling for JoJo. Jordan just snags JoJo and slams her into a wall for a passionate kissing sesh. With Chad out, the guys suddenly realize there's way more enemies than the deli-platter lover. Joining Chad in the just booted club is his buddy Daniel and James F, whose poem apparently failed him. The night ends with one last surprise: the gang is going international! To Uruguay. Guys, we're scraping the barrel for destinations at this point. Jordan gets the 1-on-1 date to the dismay of all who dreamt of a romantic solo date with JoJo in Uruguay. Also, the guys are beginning to question Jordan's motives - is he there for the right reasons? And how about Jojo? She knows he is a former pro-quarterback and InTouch Magazine, which for some reasons these guys possess, say she's in love with her ex and not there for the right reasons either. Oh drama! But it distracts from JoJo and Jordan's date of cruising on a yacht and swimming in seal-infested water. Apparently JoJo knows Jordan's ex and has heard stories about him, so wants to address her uneasiness with him now before she's too deep. Here's my question: JoJo knew of Jordan before this show because of this girl - did she know Jordan would be on the show? I'm confused. Anyways, Jordan says he didn't cheat but admits being a crappy boyfriend. Also in their severely edited down date, Jordan apparently told JoJo he's beginning to fall in love with her. She's of course quite happy with this and gives Jordan the date rose, followed by a stroll to a mariachi band and kissing and dancing in the street. The group date guys are all nervous about a weird date knowing what they read in InTouch, but producers tip off JoJo who is furious. She assures the men she's here for the right reasons and they're all back to Team JoJo. 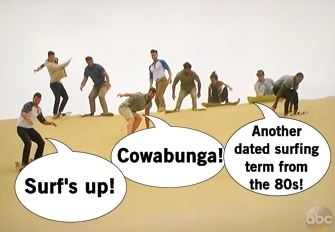 After all the drama, the fun returns with a date surfing down sand dunes. At night they head to The Grand Hotel for drinks and JoJo time. Derek is the awkward guy who is starting to feel jealous about the other connections and worries his connection with JoJo might be weakening. Alex can't stand Derek's insecurity and when Derek gets the date rose as "reassurance", Alex is even more pissed. JoJo befriends a stray dog before abandoning it for her 1-on-1 date with overly tan Robby. It's the typical tourist date where they walk around, snack, and bother street vendors. They eventually to decide to go cliffjumping in what I hope is a sanctioned area. Once they crash into the water they share a kiss. JoJo's into Robby, but Robby's WAY into her - like ready to say "I love you" already which is a bit much. While not eating the salad sitting in front of them, Robby and JoJo talk about their chemistry. Robby opens his heart up to JoJo about the passing of his best friend, which motivated him to change his whole life including ending a long relationship and quitting his job. Then Robby tells JoJo he loves her. JoJo is not appalled and instead flattered and appreciative. Robby receives the date rose and they head down to kiss on the beach under some planned fireworks. The guys convene for the cocktail party but there's a weird vibe, so Derek pulls aside the "mean girls" Alex, Jordan, Chase, and Robby. Derek thinks the guys are cliquey and while Jordan apologizes, Alex ain't having it. Jordan also apologizes to the group if he's excluded anyone at all. Everyone is just like, "Um, I'm here to not get eliminated and get a rose to leave the drama behind." JoJo nixes the cocktail party since she already knows who she's vibing with and it's onto the Rose Ceremony. JoJo eliminates Grant the firefighter, Vinny the barber, and Evan the ED specialist. No one is surprised.